Don't be awestruck by how incredible or heart-wrenching some of these photos may look; they didn't happen during Hurricane Sandy. Don't be fooled into sharing these! The image of this man piggybacking his dog was taken during a tropical storm in the Philippines in 2011. The picture of this seal was from a flooded zoo in Duluth, Minnesota, back in June, according to Snopes. It was retweeted 1,274 times. The infamous subway scuba diver has traveled everywhere — from Times Square to Bergen and Smith Street stations in Brooklyn now too, which are definitely not flooded. The shark photos originally surfaced on Facebook but made their way through Twitter and Instagram — claiming to be floating around a flooded Brigantine, New Jersey, neighborhood. Snopes points out that they're all Photoshopped. The ominous clouds over the George Washington Bridge in New York City are real, but this picture (NOT from Hurricane Sandy) is currently for sale on Getty Images. This photo of a pier collapsing in Atlantic Beach, North Carolina, is from 2011, during Hurricane Irene. From the movie The Day After Tomorrow. 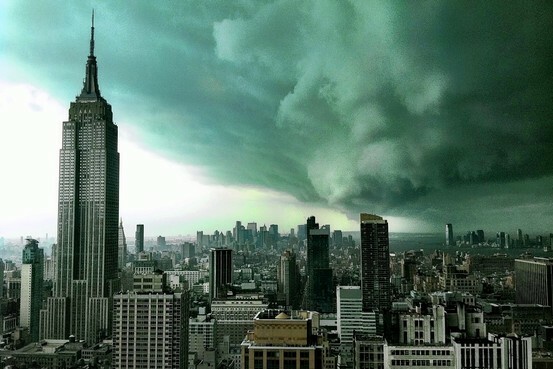 Another Day After Tomorrow image on Twitter, a popular movie choice for pictures of Manhattan during Hurricane Sandy. This satellite image was taken from the International Space Station in 2010 of Hurricane Danielle. This is often credited as Hurricane Isabel, but Snopes says it is not so: Its provenance is not known but some think it was a 2003 tropical cyclone in Australia. A Photoshop job of the Statue of Liberty and a supercell thunderstorm from 2004 taken by photographer Mike Hollingshead. 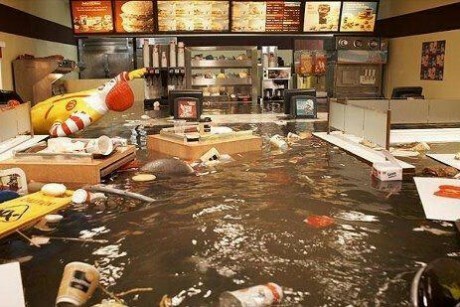 This image is from a video called "Flooded McDonald's," once part of a French art installation by the Danish Group Superflex. Not the real thing. This Manhattan skyline fake has been floating around Twitter and Instagram today, but was originally on a Wall Street Journal post from 2011. This photo was taken during a storm in September 2012, in front of the Tomb of the Unknown Soldier. Crazy satellite picture...of Hurricane Ike. From the movie Deep Impact.